What is it about the smell of bacon first thing in the morning that just makes you smile? It's one of those smells that actually makes you feel good inside. Eating bacon while still in pajamas is probably the ultimate happy combo. It's like you smell bacon and you let go of whatever else was worrying you. I should make bacon everyday because letting go is probably one of my biggest difficulties. I hang onto memories like they are gold. Almost like I cannot make new memories. It's so silly when you think about it. 1. Preheat oven to 375°. Line a baking sheet with parchment paper and set aside. 2. Unroll the dough onto a cutting board. Pinch the seams together to form one large rectangle. Slice the dough into eight equal squares with a serrated knife or dough cutter. 3. 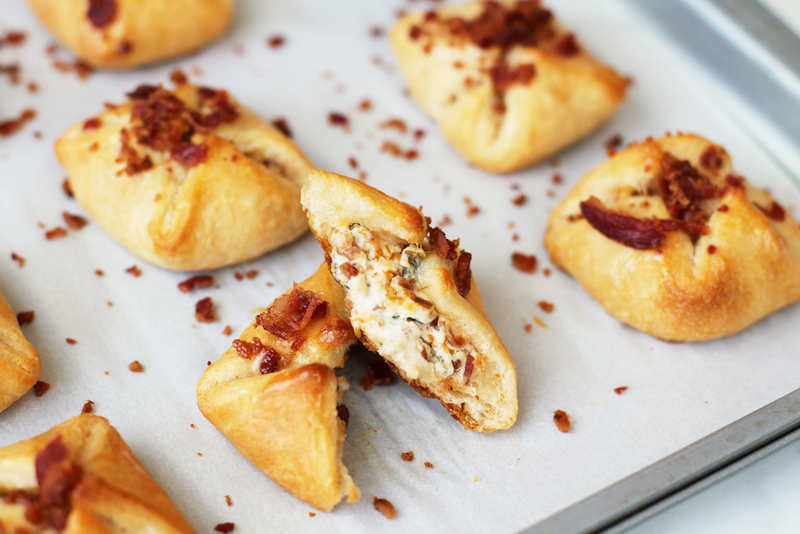 In a medium bowl combine the softened cream cheese, 4 pieces of bacon (chopped), jalapenos and cheddar cheese. Mix until thoroughly blended. 4. Place a generous spoonful of the cheese mixture in the center of each dough square. Fold up the corners of the dough to the center. Press the seams together to seal. 5. Place the bombs on the prepared baking sheet. 6. Bake for 8-10 minutes until golden brown. Top with remaining bacon crumbles. Serve immediately. Recipe from Buns in my Oven!